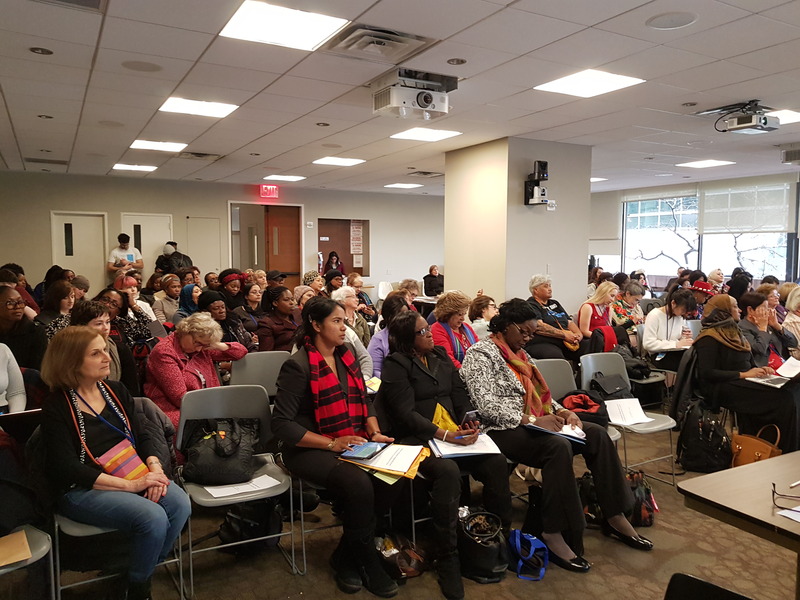 About 180 participants attended the 2ndfloor in Church Center for the ICW’s parallel event, Eliminating Poverty through Education and Rural Women’s Empowerment, held from 12:30-2:00 pm on 13 March 2018. As sponsor of the event, ICW President Jungsook Kim opened the event outlining the importance of education to eliminating poverty, a constraint on human rights, and empowerment of rural women, as well as thanking her co-sponsors, the Korean National Council of Women, the Ministry of Gender Equality and Family, Republic of Korea, and the ICW Regional Council of Americas. She then introduced and gave the floor to the moderator of the event, Vanisa Dhiru, President of NCW of New Zealand. Vanisa also briefly remarked on the importance of this topic and introduced each of the six panelists as they took the podium. The first speaker was Gia Gaspard Taylor, Founder of the Network of Rural Women Producers Trinidad Tobago (NWRPTT). She spoke about the challenges from climate change, natural disaster and impact of the extractive industry on agriculture and lives of rural women and girls. 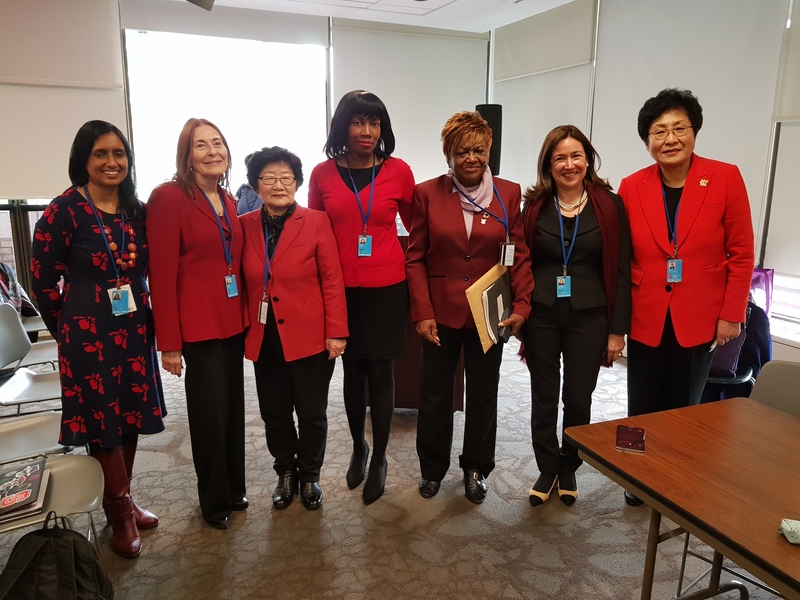 As leader of the NRWPTT, she convened seven NGOs together to assess the impact of climate change and brought proposals for training young women in defense lines and advocacy to the EU. She then introduced Roslyn, a young woman who works with her, to speak about their recycling plastic bottles program for young children in the schools. Gia closed by stressing that children are new catalysts for change as they can change their lifestyles as well as that of their parents and elders and thereby the future communities. Maria Fernanda Arduino, President of Welcome Clubs International, followed to speak about the features of poverty in Latin America. 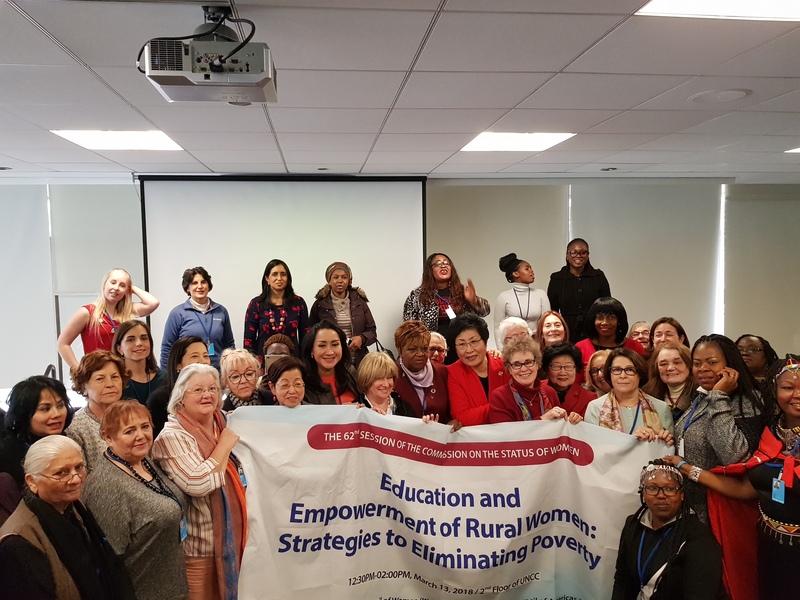 She also introduced some strategies to empower and educate rural women and girls, such as land ownership, access to resources, good education, universal education, correct segregation at work, participation in decision-making, maternal health program. Maria stressed importance of government partnership with NGOs, which can fill in the gaps such as providing moral education to rural children and helping indigenous women develop social enterprises. She closed with some examples of best practices in Brazil, such as NGOs providing employable skills training for mothers by NGOs at the schools and also running after-school programs for the students on campuses until their parents are able to pick them up after work. 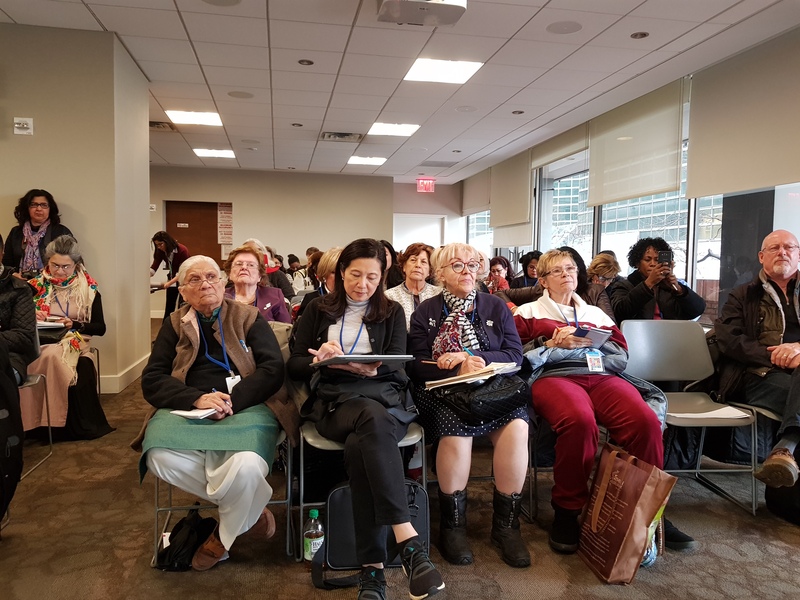 The next speaker was Sandra Cohen-Rose, President, NCW of Canada, who spoke about the importance of life skills education to creating a confident, respectful, financially secure, less violent and healthier society. These skills include communication, organization, and problem-solving. Rochelle Dean, Founder of Candid Concepts Development, Bahamas spoke on SDG goal 4, and the importance of education to empowerment and collaboration between private industry and public sector to achieve women’s empowerment. One best practice she introduced was a project between Coca Cola and the government to help women develop entrepreneurship. In her speech, Dr. Jungsook Kim presented the Saemaul Undong (New Village Movement) as an example of a best practice from South Korea. The movement started with infrastructure improvement of rural villages. Though not initially designed specifically for women, but for the whole village, the movement was successful because of the enthusiastic participation by the women. Women became the main actors of the lifestyle movement and household economy and participated in organizational activities, such as food saving campaigns and managing consumer associations, leading to the development of women’s organizations. Women also engaged in economic activities, such as working in nearby factories, increasing food production and operating child care centers, which helped to increase household income. They deposited their money into bank accounts and began to raise money to support activities for women, leading to the elevation of women’s social status and ultimately leading to more gender equality and women’s empowerment. The last speaker was Dr. Young Hai Park, KNCW and IBPW member, who spoke about the expansion of the rural programs to include migrant and multicultural women as 80% of the rural families in Korea are multicultural. These programs included teaching migrant women the Korean language, culture, family planning, home management and cooking, as well as self-help groups with mentors, to provide support and advice. Besides empowerment, the goals of these programs were to create multicultural understanding and social harmony. The audience gave the speakers a loud round of applause and asked many questions during the Q&A. In addition to questions on specifics regarding some of the best practices introduced, young women in the audience were also interested in learning how to secure attention and support of their governments, international bodies and NGOs for projects that address empowerment of young rural women. Tamra Raven, NCW of US member, remarked that this event was one of the best that she has attended at the CSW. The event gave the audience a good view of the situation faced by rural women and girls in Central and South America.